Wayne LaPierre: Don't listen to the NRA. The research saying video games cause real-world aggression isn't convincing. 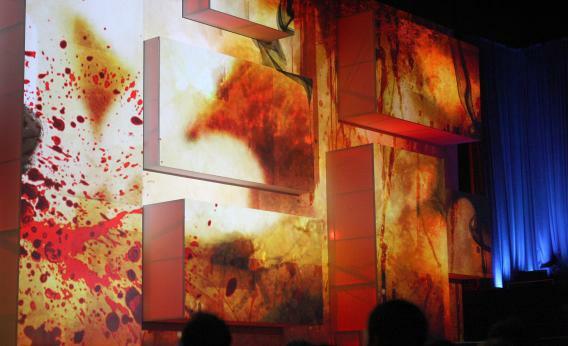 Blood spatters are projected onstage as Sony Computer Entertainment America CEO Jack Trentton introduces a violent game at the Electronic Entertainment Expo on June 4, 2012. In a press conference this morning, the NRA’s Wayne LaPierre addressed the Sandy Hook school shootings by suggesting that, rather than ban assault weapons, we put armed guards in every American school. LaPierre also blamed America’s “culture of violence” on violent movies and video games. The armed guards thing is being addressed elsewhere on this site, but suffice it to say it’s a weird and implausibly expensive idea that will never, ever happen. The video game point, however, merits a little more scrutiny. Every major scientific society that has studied the question has come to the same answer, the American Medical Association, the American Psychological Association, most recently, the International Society for Research and Aggression, have all come to the same conclusion that basically media violence is a risk factor, is a causal risk factor for increased aggressive behavior, including violence. Wow, that sounds pretty conclusive! Anderson referring to the ISRA’s report is something we call “echo attribution.” He in fact nominated all the individuals to sit on the committee, and simply didn’t include any scholars who had been critical of the “video games = aggression” link. If I put together a committee and stack the deck, I can get it to say almost anything. That statement has no credibility whatsoever. As for using my study, they absolutely misused and misrepresented my meta-analysis in that report. My data should, in no way, ever be used to support links between video game violence and aggression. We have done a number of studies of video game violence with both children and adults and find no evidence to support links between video game violence and youth violence. Furthermore, youth violence has declined to 40-year lows, not gone up in recent years. Less than half of studies (41%) used well-validated aggression measures. I read up on Anderson several years ago for a Reason book review and came away very skeptical. Take this study from 2003, “Violent Video Games and Aggressive Behavior in Young Women” as an example of his research. Anderson had young women play two video games, one violent (Street Fighter II), one not (Oh No! More Lemmings). Afterwards, he tested their willingness to administer “aversive stimuli” in the form of “loud noise blasts.” Anderson found that the women who played Street Fighter “deliver[ed] more very loud noise blasts” than the ones who player Lemmings. Thus, the conclusion that violent video games prompt aggressive behavior. Well, maybe. But perhaps it just indicates that Street Fighter II is more exciting and immersive than Oh No! More Lemmings. The study seems to indicate that video gamers experience a short-term adrenaline rush after playing an exciting game, but it requires a logical leap to connect this with any real-world violence at all, and an even bigger logical leap to then believe that video games are in large measure responsible for real-world violence. Anderson’s work has also been supported by a group called the National Institute on Media and the Family, which, before it closed in 2009, was essentially an anti-gaming lobbying group. I’m no psychologist, and I certainly haven’t read everything Anderson has ever published. I’m confident, though, that there’s good reason to be skeptical of his claims—and of the people who use them as a way to avoid addressing gun control.